So, this lunch was inspired by these teeeeny little toasts that I found at the grocery store in the cheese aisle. SO CUTE! And I know this doesn't look like much food, but he didn't even eat it all. I have learned to no longer be stressed about that. Anything not eaten at school he eats after school as a snack. He's healthy and not starving so if he talks more than eats at lunch....oh well! Packed in a small square snack box Kidlet has petite toasts, soy ham and manchego cheese on panda skewers, a clementine segment, and pomegranate. On the side is a small container of applesauce. Trying for you too, on Safari on my MacBook! Mia Bella loves those little breads. Anything mini just makes food look sweet :) I like your attitude about his eating too, and Bella does the same thing, she often pulls her lunch back out on the way home from school - they do only get 15-20 minutes. 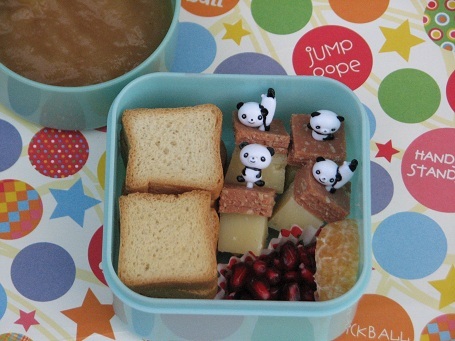 The little toasts are so perfect for bento! The cuteness topped with the panda skewers!